The SM75CF2 is an outdoor vandal resistant surface mount clear dome housing from Videolarm that is designed to provide high use in a number of surveillance installations for optimal camera protection. The SM75CF2 dome housing is able to be installed facing upwards towards the sky or downwards towards the ground, it also features high compatibility with IP network fixed cameras, a cast aluminium top, an IP66 rated exterior, plus a universal mounting plate, and security fasteners. The SM75CF2 camera housing also features an optional wall mount, removable side conduit entrances, an optically clear polycarbonate dome, plus a thermostatically controlled heater, and surge protection. 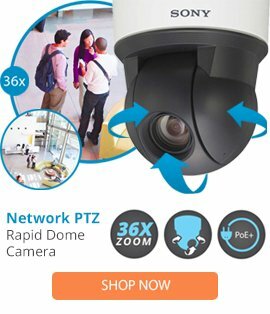 This security camera housing is ideal for high use in a number of installations, and delivers exceptional camera protection for most major brands of cameras.